This weekend, take the kids out to make some soap, go to a bicycle rodeo, check out the bee festival and so much more! All happening this weekend in and around Boulder. Courageous Soap will be the featured artist at Art Market in Old Town Lafayette this Friday and will be hosting a live demo that you and your kids can attend! At the event, you will learn fancy, schmancy soap-making: you will learn how to make adorable little glycerin soap minis that you can bring home. The Art Market is part of the popular Art Night Out event in old town Lafayette, Colorado. This free, family-friendly community event is held each second Friday from May through September from 5-9pm, with live music, food trucks, beer and wine and more! This soap making demo will be a one-time event. The Art Market is located on South Public Road between Cannon and Emma Streets. The soap making demo will be held on Friday, June 8, 2018 from 5PM – 9PM. Art Market is free, cost to make soaps is $3 – $5 for supplies. BDT Stage is having tea under the sea at Tea and Sweets with Ariel and Friends! Grab your dinglehopper and get all dressed up for a tea party with Ariel and friends! Party includes character meet and greet, activities, tea and sweets. Space is limited. $25/person. Make your reservations for one of 3 tea parties on June 9, 23, and 30 by clicking here. Or see the BDT Stage performance of The Little Mermaid all summer long! Boulder Dinner Theatre is located at 5501 Arapahoe Ave, Boulder, CO 80303. Tea and Sweets is $25/person, Tickets available here. Bicycle Rodeo is an annual event is for children 12 and under to learn about bicycle safety from Lafayette police officers. There will be a road skills course, helmet fits, bike safety inspections and lunch! Participants need to bring their bike and safety gear and will need to be accompanied by an adult to sign a release & waiver form. Forms are available day of event. There are also several local sponsors at this event to help make it fun for the whole family. Great event to kick off summer bike riding! Bicycle Rodeo is located behind Flatirons Church and West of Romero’s K9 Club, 355 W. South Boulder Road, Lafayette, CO 80026. Event will be held June 9, 2018 from 9AM – 12PM. Admission is FREE. Marchers, bring your friends and family and join the Boulder March for the Ocean at the Colorado Ocean Coalition, Eco-Cycle and Ocean First Institute tables at the Boulder Farmers Market between 8:00am and 12:00pm to learn about our connection to the ocean, plastic pollution, reducing, reusing and recycling, and more. You can also make posters for the March and get your face painted! The March will begin at the Boulder Bandshell at 12:00pm (walking distance from Boulder Farmers Market). Please wear blue in support of the ocean! Also, please bring your own poster materials and organizational banners. For more information on the national march, please visit https://marchfortheocean.org/. The March for the Ocean will begin at the bandshell in Central Park at 1236 Canyon Blvd, Boulder, CO 80302 on June 9, 2018 at 12PM. Participation is FREE. At Page to Peaks, Village at the Peaks will bring the book, The Very Hungry Caterpillar by Eric Carle to life as a FREE festival. Activities include:butterfly demonstrations, aerialist performances, live music from Jeff and Paige, interactive storytime, free samples of the caterpillar’s food, crafts, games, photo booth, butterfly caricatures, as well as book-themed face painting and balloons. Village at the Peaks is located at 1250 South Hover Road, Longmont, CO 80501. Page to Peaks will be held June 9, 2018 from 10AM – 1PM. Event is FREE. The Boulder Clothes Pony and Dandelion Toys is celebrating its second birthday! Kids will enjoy birthday cake, yummy snacks, fun game demonstrations, giveaways, Train Play Day with Brio, Glitter tattoos and more. Boulder Clothes Pony and Dandelion Toys is located at 1909 9th St, Boulder, CO 80302. This birthday party will be held June 9, 2018 from 10 AM – 2PM and is a FREE event. Kid and pet friendly. Join the Boulder JCC Milk and Honey Farm and PJ Library for a Storywalk as we explore the farm and bring to life “Bone Button Borscht,” a story about a beggar who teaches a village to share. Plus you can visit with the baby goats! Program targeted for families with children 8 and under. The Boulder JCC is located at 6007 Oreg Ave, Boulder, CO 80303. Storywalk is planned for June 10, 2018 from 3PM – 4:30PM. FREE to attend – Registration Encouraged. Register here. Bee Festival is a youth-focused pollinator event at Ollin Farms in Longmont. Meet, talk and learn from local beekeepers. 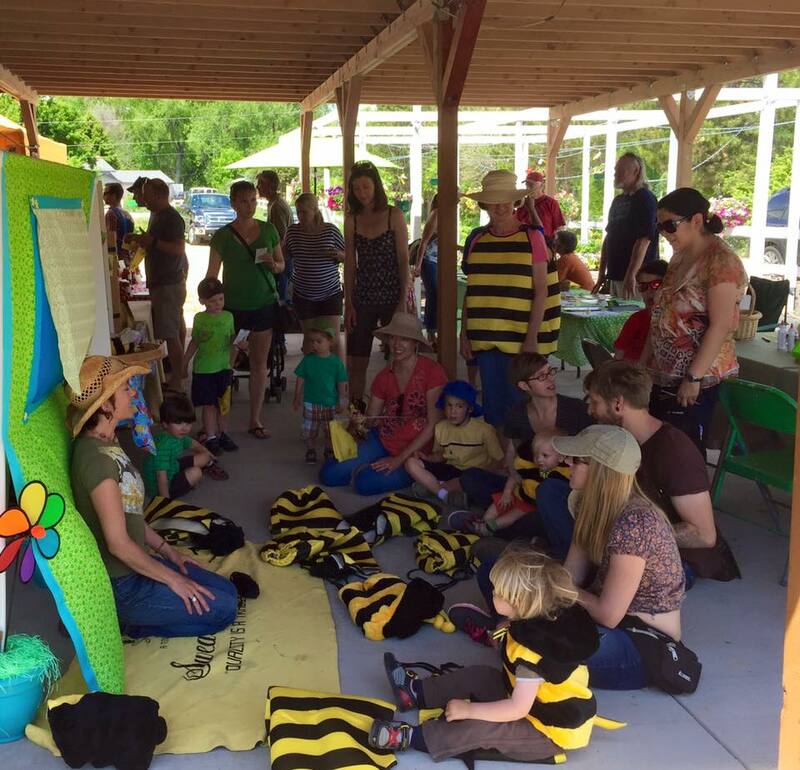 Other activities include: bee stories and songs with the Library bookcycle, crafts and activities for kids, honey recipes from members of the community, information and activities with Pollinators Safe. Ollin Farms is located at 7718, 8627 N 95th St, Longmont, CO 80504. The Bee Festival will take place on June 10, 2018 from 12PM – 3PM. Admission is FREE. Check out the super fun PAWS to Read program this weekend at the Lafayette Public Library! Kids ages 5-10: Spend 15 minutes reading to a special therapy dog. They are cuddly, good listeners who would love to hear your stories. Lafayette Public Library is located at 775 W Baseline Rd, Lafayette, Colorado 80026. PAWS to read is held this Sunday, June 10, 2018 from 1:30PM – 2:30PM. Event is FREE. This Sunday is the first Summer Sundays event of 2018 at the Brunner Farmhouse! And there will be fun, new additions to the events this year. There will be carnival games and prizes, face painting, instrument petting zoo, children’s crafts, storytelling, bouncy house, a North Metro Fire Rescue District fire truck for the kiddos, a Century Chevrolet car for everyone to draw on, a hula hooping contest, and icy treats from Kona Ice of Broomfield and Arvada. We might also have a hula hooping artist and athlete show us some tricks! Then, stay after the festival from 6-8 p.m. for a live concert by the Journey Girls, a popular Journey tribute band and prize giveaways! These events are brought to you by the Broomfield Council on the Arts and Humanities (a local nonprofit organization since 1973). Participating groups with booths include the Broomfield Symphony Orchestra, Broomfield Art Guild, and Broomfield Spellbinders. The Summer Sundays Festival is held at the Brunner Farmhouse, located at 640 Main St, Broomfield, CO 80020. The event runs from 4PM – 8PM on Sunday, June 10, 2018. This event is FREE. A gnome. A Tree. A mushroom. What could go wrong? Join the Public Works Theatre Company in this rollicking outdoor romp as a band of clowns seek an audience to tell their tale in Oh Gnome You Don’t. Bring a blanket or pack a picnic for this family event at Whitetail Park. This show is Pay What You Think It’s Worth at the event. You may pay using cash, check, or credit card. Whitetail Park is located at 2550 Autumn Ridge Blvd, Lafayette CO. The event will be held June 9 & 10. 2018 from 10AM – 10:45AM. This show is Pay What You Think It’s Worth at the event. You may pay using cash, check, or credit card. Visit the B-25 Bomber “Maid in the Shade” at Rocky Mountain Metro Airport all weekend long. Built in 1944, the B-25 “Maid in the Shade” was developed by North American Aviation and used mainly as a low altitude strafe and skip bomber. Nearly 10,000 B-25s were produced and the B-25 Mitchell “Maid in the Shade” is one of 34 still flying today. Hosted by Mile High Wing of the Commemorative Air Force. Rocky Mountain Metro Airport is located at 11755 Airport Way, Broomfield, CO 80021. Tours available from 2PM – 6PM. To tour the bomber, tickets are $10/person or $20 for a family of 4. To take a ride in the bomber, tickets are $325+. More info available here.